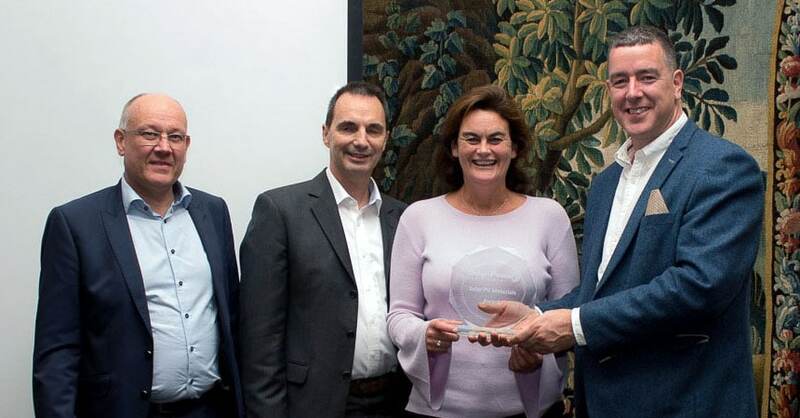 Karin Vercauteren, PhD, Head of Agfa’s Materials Technology Centre, Dirk Quintens, PhD, R&D Manager Functional Foils and Juergen Jung, PhD, Research Leader Imaging Systems received the 2018 Solar PhotoVoltaic Material Award from the hands of Mr Michael McCarthy, CEO of Irish Solar Energy Association. 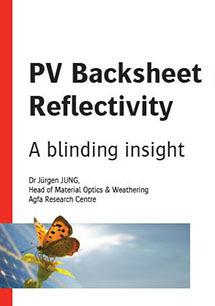 The scientific White Paper about the impact of backsheet reflectivity on the power yield of solar modules. Request your copy right here. September 26, Agfa Specialty Products was announced the winner of the Solar + Power Award 2018 within the Solar PhotoVoltaic Material category for the breakthrough technology of their UNIQOAT backsheet product. Agfa Specialty Products was shortlisted for their UNIQOAT backsheet technology by a panel of judges that includes people representing the Solar Industry value chain, associations, institutes and Universities. The industry then casted vote for the best company, project or product through an online voting process. This year Agfa won with highest number of votes beating other contestants in the Solar PV Materials category. Whereas the PV industry strives for solar modules that have the different layers encapsulated together as one inseparable block, it has had to accept relatively low adhesion values between the layers of laminated backsheet. 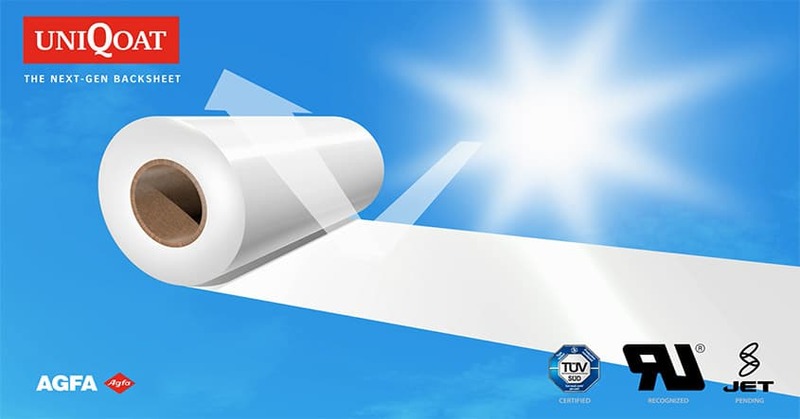 Agfa’s UNIQOAT fundamentally eliminates adhesion issues and the risk of delamination by offering the backsheet that includes all relevant functionality in one single layer: the mono-backsheet. This is achieved by using Agfa’s proprietary coating technology to modify the PET surface during the PET extrusion process itself. 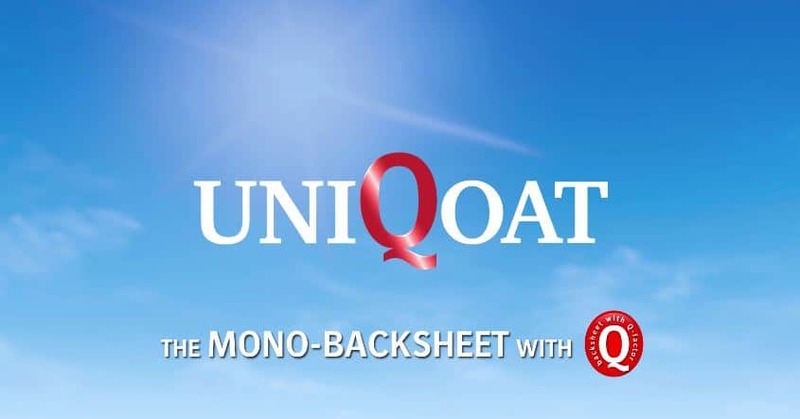 All UNIQOAT backsheet types are the result of this unique one-step manufacturing process. Compared to backsheet production via consecutive steps UNIQOAT holds great cost reduction potential and opportunities for future developments. E-mail our webmaster if you have questions or problems regarding this Web site. © 2018 Agfa-Gevaert Group. All rights reserved. Last updated on : 13th February 2019.